The two-day Innovation and Entrepreneurship Symposium 2018 will teach participants how to network and turn their business concepts into reality. Make the connections that will help you make your ideas and dreams become a reality. Spend a couple days at UC Merced meeting successful entrepreneurs and hearing how they have brought their ideas to life, learning about the essentials of entrepreneurship, gaining foundational knowledge, and exploring the strengths and weaknesses of your entrepreneurial plan in this special series of workshops. The event takes place from 9 a.m. to 5 p.m. Feb. 2 and from 10 a.m. to 5 p.m. Feb. 3, in Kolligian Library Room 355 on the UC Merced campus, and is open to everyone from the community and the campus community. Tuition is $50 per day for the general public, and $20 a day for UC Merced students, and you can register online at bit.ly/UCMBusiness. Pitching your business idea is key in keeping your plan moving forward. At this event, you’ll hear from experts how to develop a pitch that will make people listen. You’ll be able to forge network connections and learn from challenges others have encountered on their journeys, and learn more about the resources that are available to you in and outside of our communities. The event features innovation and team building exercises; workshops on entrepreneurship and leadership, startup foundations, startup finance, pitching, disruptive innovation, business modeling and planning, building an effective team, angel investing, crowdfunding and initial coin offering, and networking; as well as business lunches; panel discussions; a keynote address; and a “pitchfest” with prizes. Students who attend all IES modules will earn an Innovation and Entrepreneurship Symposium (IES) completion award. Anita D. Bhappu is an associate professor of management with expertise in team development, consumer research, business model and customer validation, and digital and services retailing. Jane Binger and her teams have provided leadership education for nearly 5,000 professionals, researchers and students in the U.S. and Canada. She is co-founder and chief learning officer of DeepTok, and a senior advisor for the Center of Excellence in Diversity in Medical Education at Stanford University Medical School. Trevor Cox enables startups to grow and scale their businesses by providing assistance with fundraising, sales, legal, business development and operational needs. John Haner is a lecturer in the Karen Merritt Writing Program at UC Merced, teaching business communication. Karim Lessard is the CEO of a software company in Seattle and an experienced startup entrepreneur, bringing lean methodologies to develop new business ideas. Russ McBride is an assistant professor at UC Merced and former director of a successful startup incubator, doing theoretical work on the structure and activity of entrepreneurship. Alexander Petersen is an assistant professor of management, focusing on innovation and information diffusion. Theofanis "Fanis" Tsoulouhas is a professor of financial management at UC Merced. His research interests include corporate governance and finance, entrepreneurship, tournament theory, contract theory and the economics of information. Victor Wang is CEO of care.coach, a startup that provides digital patient support avatars for hospitals and health plans. The event is sponsored by The Entrepreneurial Society (TESUM) and the Office of Student Life; Office of the Dean of the School of Social Sciences, Humanities and Arts (SSHA); Management of Innovation, Sustainability and Technology (MIST); the Center for Career & Professional Advancement (CCPA); and Jane Binger, Ed.D., and Robert Bernstein, M.D. 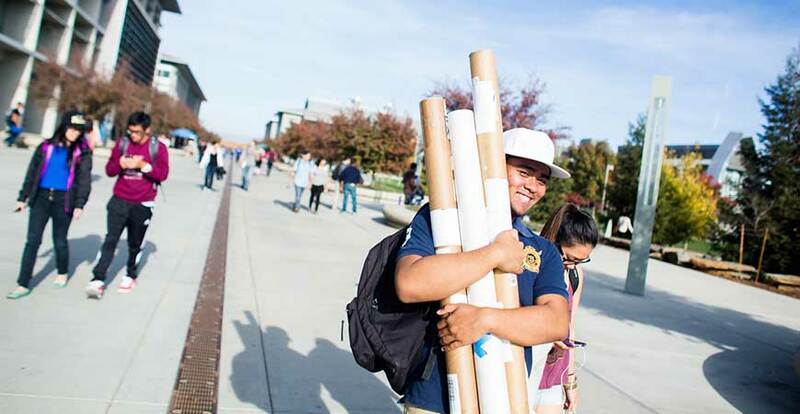 Contributing student clubs and campus entities include the Business Society, the Innovation and Entrepreneurship Lab, UC Merced iRISE, the Institute for Research in Innovation, Sustainability and Entrepreneurship, the Microfinance Project at UC Merced and the Karen Merritt Writing Program.